At Ashbrook Roofing, we have a wide selection of essential roofing felt, including shed felt. Our products come in a range of budgets, although the high quality of all of our materials is intended to keep your shed watertight and protected from the elements. Whether you’re a DIY enthusiast improving the garden shed or a professional tradesperson in need of materials, our selection makes it possible to find everything you need in the one place. 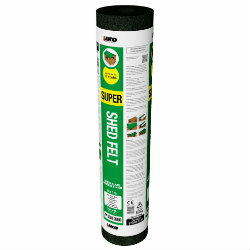 As well as shed roofing felt, we also stock felt roof shingles and roofing felt adhesive. What’s more, we can even get your materials to you the very next day, when you place your order before 2pm. Browse our full selection of roofing materials and shed felt online today, and make your order with Ashbrook Roofing. We’re roofers by profession and with more than 30 years’ experience in the industry, we know what it takes to get the job done.